Allegiant Travel Company today (April 3) announced plans to establish a two-aircraft base at Savannah-Hilton Head International Airport in Savannah, Georgia. Allegiant began operating at Savannah-Hilton Head International Airport in 2015 and with today’s announcement now offers 15 nonstop routes – to Albany, Niagara Falls and Newark in the New York region; Cincinnati, Cleveland and Columbus, Ohio; Grand Rapids, Michigan; Indianapolis, Indiana; Louisville, Kentucky; Nashville, Tennessee; Pittsburgh and Allentown, Pennsylvania; Portsmouth, New Hampshire; Providence, Rhode Island and Baltimore, Maryland. Savannah will become the airline’s 17th aircraft base, which will allow Allegiant to expand its service to and from the city, offer more new nonstop routes in the future. Top Copyright Photo: Allegiant Air Airbus A319-111 N317NV (msn 2477) LAX (Michael B. Ing). Image: 944029. 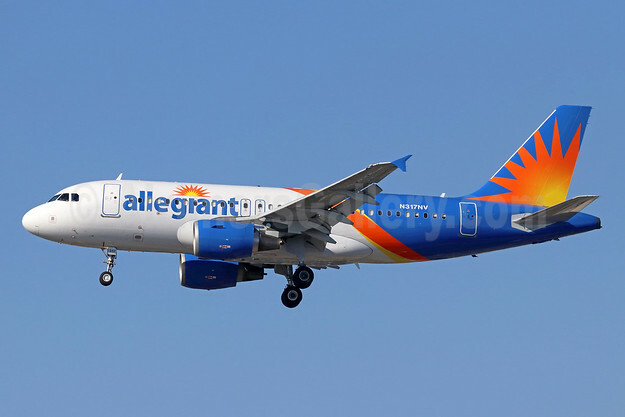 This entry was posted in Allegiant Air and tagged airbus a319 111, Allegiant Air, msn 2477, N317NV on April 3, 2019 by Bruce Drum.